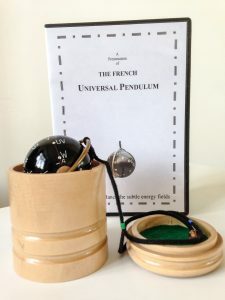 The Universal Pendulum was developed in France in 1936 by the dowsers Chaumery, de Belizal and Morel, though not until more recent times has it become more widely known. It possesses unique possibilities within, for example, the field of energetic analysis and therapy. Its construction employs the principle that geometric forms and shapes radiate natural energies. The U.P. as it is called in its abbreviated form, works rather like a radionic instrument, though it has advantages over some of these. It is not dependent upon electricity to operate it, but instead draws upon the energies of the cosmos. The pendulum radiates even when at rest, as can be shown using Kirlian photography. It is extremely important therefore that the pendulum be adjusted to Green plus when not in use. One of the reasons why this powerful device was not made more widely known is because of the potentially dangerous rays, which can be used to heal, but which can also harm. 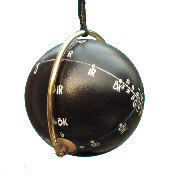 The Universal Pendulum is available in two sizes. The smaller, U.P.5.4 is a sphere with a diameter of 5cm. which contains a 4-cell `battery` consisting of 4 aluminium hemispheres, along the main polar axis. Between the poles, the sphere is held by a copper semicircle to which is attached a cord. The cord can be adjusted along the length of the copper semicircle, and the whole can rotate through 360 degrees around the axis. Looking at the sphere as the Earth, the equator is the location of the so-called electromagnetic radiations, whilst on two other longitudinal meridians are the so-called magnetic and electric radiations. This factor also differentiates the Universal Pendulum from other traditional radionic instruments, which only work with electromagnetic radiation. On the cord are three marker points and, according to which is being held, determines whether electromagnetic, magnetic or electric energies are being created. The U.P. is not a complicated instrument, very easy to use with simple principles behind it’s construction. In fact it is so uncomplicated, (and very much less complicated than many other energy systems) that it is surprising to find some so-called expert dowsers/energy therapists who cannot see it for what it is. It is just another simple tool to do the same job as they are trying to do with their simple or not so simple systems. You do not need a degree in science or medicine to appreciate this. Using “codes” to access and identify energetic systems is widely used and accepted. These codes need to be “made” and “unmade”, i.e. cyphered and then deciphered to make any sense. Colours are a code – they happen to be in word. As such, colours need no cyphering or deciphering. Colour coding is a very easy system to use because colours are relatable. For instance, colours are relatable to the chakras and the aura which enables us to “see” them. The U.P. utilises a wider reference point than the visible spectrum, not necessarily to assist the dowser, but to reflect the larger reality. The reference point is in fact the wider electromagnetic spectrum. Here we refer to the “colour” range described on the U.P. which goes beyond the visible colour scheme. The visible colours of the rainbow are only a part of the electromagnetic spectrum. If we use only the visible colours for analysis and treatment, it can be argued that we limit effectiveness. (It is more simple to build a car than a space ship so are we going to stop trying to take off?) But, in any case, it is not an invention that the electromagnetic spectrum continues on either side of red and violet. That is an acceptable fact. What is invisible to the naked eye cannot be denied to exist. So, use what you can from these pages. Nothing known by human minds is absolute – history bears witness to that. There are two things involved here. One is the dowsing principle using a pendulum. The other is the principle behind the energetic vibration of shape and matter, a framework. The two are combined in the U.P. If you accept that everything in the universe is alive, vibrates and is interconnected, then that is about as simple as things can get. Grow from there and use whatever information anywhere is of help to you. Those who want things to remain constant have a fear of expansion and a wider awareness. What you read here is to assist in expansion of awareness and consciousness and not to be taken as a be all and end all. The same goes for the other dowsing pendulums mentioned on this site. They all have their place. The larger U.P. 6.6 has a sphere diameter of 6cm and contains a 6-cell `battery`. It is also heavier and emits a much stronger radiation than the U.P. 5.4 due to its size. Being lighter and more responsive the smaller U.P. has a higher sensitivity. Both do the same thing. Contrary to some opinions it is not necessary to have both in order to effect treatment. A highly polished solid, aluminium U.P. with a 5cm diameter is also available by special order. 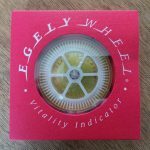 These are highly specialised tools for use in colour therapy (chromotherapy), the detection of harmful earth and water energies, the dispersal of viruses and bacteria, the measurement of vital energies, balancing, harmonising, energising and much more. Tuning in to the Higher Self becomes more natural and automatic with practice. Our U.P. is supplied inside a wooden presentation box, together with our exclusive informational DVD – The presentation of the Universal Pendulum on the DVD is not a user manual and is not a training course. It does however describe the U.P. construction and theory of how it works. The aluminium version is made to order and not always in stock so please allow time for delivery.